Known widely as one of Scotland’s greatest living poets, Don Paterson is also a master of the aphorism. These pithy, witty, and bitty pieces live somewhere between poetry and prose, encapsulating the full panoply of the human condition. 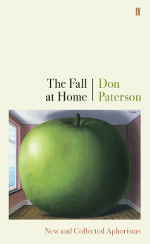 Join us as Don launches his New and Collected aphorisms, The Fall at Home, and mixes in a few poems along the way. As a Professor in St Andrews, poetry editor at Picador, and author of many volumes of criticism and poetry, Don is not to be missed.